Development of the personnel is one of the fundamental functions of management. Effectiveness of the realization of this function causes quality, efficiency and productivity of the worker’s labor. High level of motivation and loyalty, commitment to the organization contribute to reach organizational goals in the shortest period of time. It becomes obvious on the contemporary stage of the organizational development that the ability to select and prepare high potential manager for work on high position influences on the competitiveness of the organization on the market [1, p. 57]. The plan of the personal development of manager may include working together with more experienced professionals or high level managers. Furthermore, due to the process of globalization and integration it is very important to include in the plan of the personal development English language training, because foreign language competence can provide the higher level of managerial competence. Additionally, assessment results can help to find the most appropriate methods of personal development [2, p. 64]. Development of the “talent pool” is a great investment in the intangible assets of the organization, which increases value of the human resources and makes the position of the organization on the competitive market better. Questions of personnel development were considered in the works of many scientists, such as A.Y. Kibanov, T.Y. Bazarov, V.R. Vesnin, A. P. Egorshin, G. V. Shchekin, I. K. Makarov, M. Armstrong. Methodology of the manager’s development was directly studied by D. Zinin, V.V. Belousov, E. G. Belsky, A. P. Dobrovinsky, I. A. Bespalov, E. A. Mitrofanova. The main aims of work are to study current methodological approaches to development of the high potential managers and to develop an alternative methodology of the development of the high potential managers [3, p. 86]. First of all, it is necessary to understand the exact definition of the “personnel development” term. Analysis of the different approaches to the defining of this term has revealed certain patterns (picture 1) [5, p. 354, 7, p. 448]. On the one hand, development can be considered as a process, which is directly aimed at the education of the staff, development of their personal and professional qualities. But on the other hand, it can be considered as a complex of special activities measures for the increasing of the labor efficiency. According to the last treatment employee will get the career growth as a result. 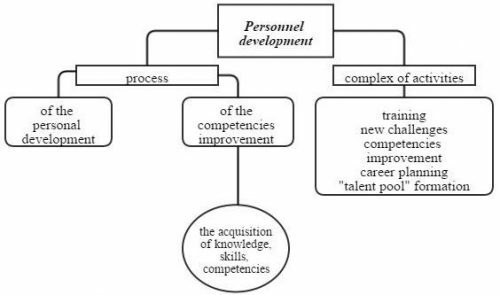 In the frame of this work “personnel development” has to be considered as a complex of special measures for the improvement of workforce using. 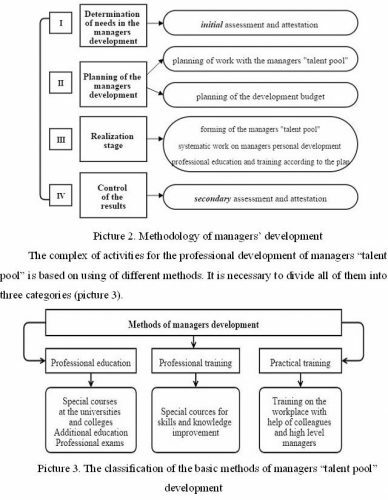 Thus, the first step of creating the methodology of the high potential managers’ development is the detection of the factors, which influence on the necessity of managers development. It can be a competitiveness on different markets; scientific and technological progress; change of the organizational activity type; implementation of the new methods of human resource management [4, p. 53]. Moreover, the system of manager’s development has to be strongly connected with the entire strategy of the organizational development. If the organization develops the Production Quality Assurance Strategy, the manager’s development system has to be focused on the improvement of manager’s qualification, implementation of new systems for the control of labor quality. If the organization develops the Innovative Growth and Organizational Development Strategy, it needs to develop managers by professional education. Technical Strategy implies the stimulating of creativity of managers and encouraging of the participation in the process of optimizing and improving of management. Authors have developed the methodology of development of managers, which involves four stages (picture 2). The first stage may include an initial assessment and attestation of management for possession of all necessary for the efficient activity knowledge and skills. The result of these procedures is a number of high potential managers for development. For the second stage it is necessary to understand the meaning of the managers’ “talent pool”. 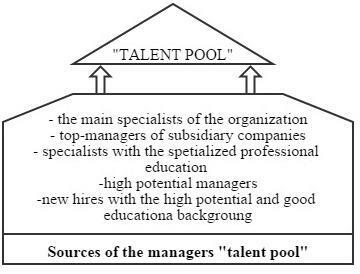 V. R. Vesnin specifies the managers’ “talent pool” as a group of managers and specialists, who have the ability to the managerial activity, managerial qualification and high managerial potential, meet all requirements of the position, selected in a special way [6, p. 76]. It is expedient to use search resources, which have shown on the picture 4 [4, p.51] on the stage of realization of planning measures aimed at the formation of managers “talent pool”. Assessment by competencies, which helps to assess the compliance of the manager with all requirements. Thereby, the development of high level managers may happen in three directions: in the direction of the professional education, in the direction of professional training or in the direction of practical training. The combination of the development within the work process and training outside of it may become the best approach to development in this situation. It will satisfy all managers’ needs and ensure their efficient activity. Borgardt E. A. Strategic management of the sustainable development of enterprises [Text] / E. A. Borgardt // Actual problems of Economics and Law, 2013. — №1 (25). P. 55-61. Kifa L. L. Methods the formation of professional competence of specialists in the field of personnel management [Text] / L. L. Kifa // Proceedings of the Samara Scientific Center of the Russian Academy of Sciences, 2008. — № 8. — P.50-55. Nikishina A. L. Human resources as a major factor in increasing the competitive advantage of enterprises [Text] / A. L. Nikishina // Bulletin of the Volga University after V. N. Tatishchev., 2013.- № 2 . P. 70-77. Vesnin V. R. Practical management of the personnel: a guide to personnel work / V. R. Vesnin. — M.: Jurist, 2010. — 496 p.
Yurlov Y. N, Orlyanskaya, G. L. HR Management: lectures / Y. N. Yurlov, G. L. Orlyanskaya. — Cherepovets: IMIT Polytechnic University, 2009 — 168 p.